Two of my illustrations will appear in the 2019 Creative Cronies Moon Diary - Woohoo! This is a delightful New Zealand publication that I am so proud to be a part of. It includes astrological predictions & guidance. gardening by the Moon, inspiring art, and Mayan Calendar Ninth Wave Spiritual Days and Nights. Besides compiling the Moon Calendar and Moon Diary, astrologers Arafelle and Minerva live on co-operatively owned land in the Far North. Robyn lives in the Coromandel. We all three produce the Moon Calendar and Moon Diary and are now celebrating our 27th year of production. We feel it is a gift from the Goddess and it is our privilege to have an avenue to present some understanding and astrological guidance in these tumultuous and transformative times. To begin I'll share a little something about me: I'm 52...I'm Canadian and American...I fell in love with color and creating (everything! but esp. painting women) when I was knee high to a grasshopper...I've been a soul reader for the past 8 years...I'm in love with the mystical magical faery elf celtic shamanic pagan witchy realms...but I keep things LIGHT (yet deep)...I've created an oracle deck (the Lefty Oracles) based upon 17 years of drawing with my non dominant hand and 8 years of giving readings...my latest adventure and passion are my SPIRIT ANIMALS...and that is what I'll be sharing with you today. Here are 3 of my favorite Spirit Animals + their poems. The originals are $75 and prints are $25 with FREE worldwide shipping and can be purchased below. 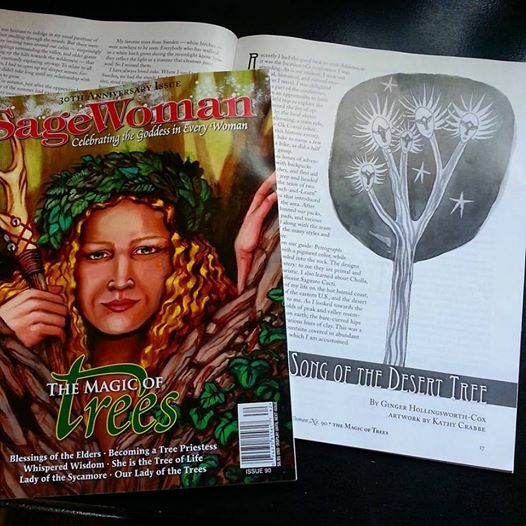 Two of My Illustrations Are Published in Sage Woman Magazine! This will be my second time illustrating an article for Sage Woman Magazine. Both illustrations were painted in walnut ink. This first was painted after a trip to Joshua Tree, California and depicts a Joshua Tree. Both originals are available for purchase.